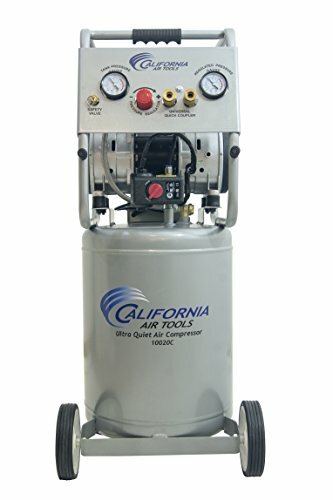 The CALIFORNIA AIR TOOLS 10020C-22060 Ultra Quiet & Oil-Free Air Compressor is designed to be one of the quietest 2.0 Hp air compressors in the industry having only 70 decibels of sound. The Powerful "New" 2.0 HP (SP-90407) motor operates at only 1680 RPM creating less noise and less wear. The "New" SP Series of Ultra Quiet Air Compressor Motors have been designed to increase duty cycle and allow for longer continuous run times. The Oil-Free Dual Piston Pump System is engineered for high performance and durability. The CAT-10020C-22060 Air Compressor has an Oil-Free Dual Piston pump designed to have a life cycle before wear of 3000 plus hours compared to other comparable air compressors with life cycles of 500 hours or less. The Oil-Free pump allows for use in a variety of temperatures (cold starts) and uneven terrains (no oil in the pump). The Easy Start Valve feature allows for a easier start up using less starting amps. The Easy Start Valve releases a small amount of air from the pump at start up to produce a no-load condition allowing the motor to spin freely. This no-load start up requires less amps for an easier start up in cold temperatures. The large 10 Gallon Steel Air Tank with wheel kit makes it very easy to move around the jobsite, shop or garage. Designed for the person looking for Power, Air Flow, Less Service and Maintenance with at Least 30% Less Noise!. If you have any questions about this product by California Air Tools, contact us by completing and submitting the form below. If you are looking for a specif part number, please include it with your message.